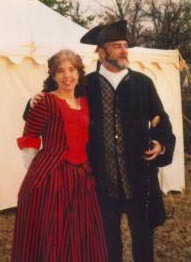 For 15 years, Denny and Barbara Duffy have been performing for historical sites, trade fairs, reenactments, period dances and special 18th century events. Their music brings a touch of the time period with vocals and instrumentals and historical interpretations of the music. Featuring hammered dulcimer, guitar, harp, English guitar, and vocals. Copyright © 2006 Dennis & Barbara Duffy. All Rights Reserved.